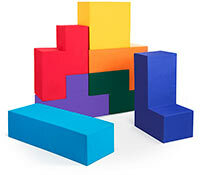 Pufus is a set of seven bright poufs in the shape of Tetris figures. Though Pufuses look large and massive, in reality they are easy to move and can be arranged in a variety of combinations. The poufs are made of durable polyurethane foam and covered with brightly colored thick waterproof fabric which makes them ideal for use at home, in the office or outside: in parks, squares, summer cafés or country cottage gardens. Pufuses are comfortable to sit and lie on and can be easily arranged in a solid wall for storage. Pufus furniture is made to order only and will be delivered in two weeks after purchase.